Dmitry Borisovich Kabalevsky (born December 30 [December 17, O.S. ], 1904, Leningrad (now St. Petersburg), Russia – died February 14, 1987, Moscow), was a great Russian Soviet composer, pianist, conductor, teacher and public figure. He was an important figure in the musical life of the Soviet Union. Kabalevsky composed operas, ballets, choral works, incidental music for plays and radio productions, film music, four symphonies, a number of concertos, chamber music, songs, and piano pieces. Of these works, the best known in the West are the overture to his opera Colas Breugnon, The Comedians, a suite for small orchestra, his Second Symphony, the Violin Concerto, the Sonatina in C Major, and other piano works for children. Dmitry Kabalevsky was born on December 30, 1904, in Leningrad (now St. Petersburg), Russia. His father, Boris Kabalevsky, was a mathematician and his mother, Nadezhda Kabalevskaya, was a housewife. Kabalevsky’s father wanted him to find a career in economics or mathematics, however, in early life Dmitry maintained a fascination with the arts, he painted and dabbled in poetry as well as excelling as an aspiring pianist. 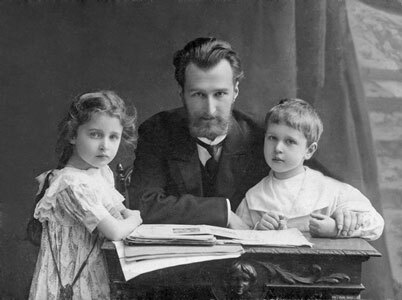 Boris Klavdievich Kabalevsky with his son Dmitry and his daughter Elena, St. Petersburg, 1909. 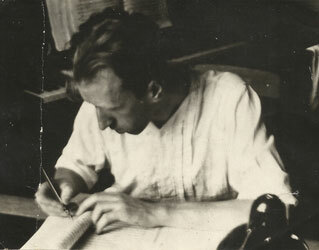 In 1918, Kabalevsky moved with his family to Moscow, where he studied at the Scriabin Music School from 1919 to 1925. Kabalevsky began writing music at age 18, at first mostly works for the piano. In 1925, against his father’s wishes, Kabalevsky entered the Moscow Conservatory, where he studied piano with Alexander Goldenweiser and composition with Nikolai Myaskovsky, graduating in 1930. He began teaching composition at the conservatory in 1932, developing an excellent reputation as a music teacher, and was made a full professor in 1939. During these years he wrote his first major works and also served as senior editor at Muzgiz (the state-owned music publishing house). During World War II, he wrote many patriotic songs, having joined the Communist Party in 1940, and was the editor of Soviet Music (Sovetskaya Muzyka) for its special six-volume publishing run during the war. Kabalevsky helped to set up the Union of Soviet Composers in Moscow and remained one of its leading figures. He also composed and performed many pieces for silent movies and some theatre music. 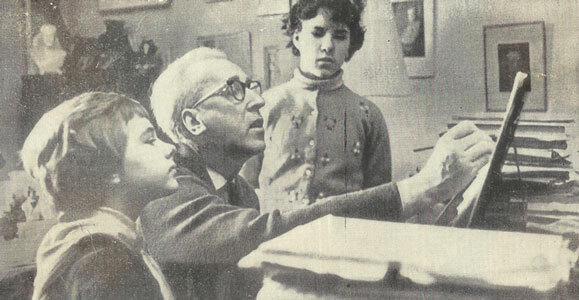 Kabalevsky made several European tours after World War II, playing his own music, and he won numerous awards in the Soviet Union, for his music and teaching as well as his loyal service to the government. From 1949-1952 Kabalevsky was a head of Music Department of Moscow Art Institute. In 1952 he was made a secretary of the Union of Soviet Composers and remained in the leadership for 35 years. In the 1950s and 1960s, he was one of the most powerful figures in Soviet musical life. Kabalevsky’s early music shows the influence of his teacher, the Russian composer Nikolai Myaskovsky; his own personal style, characterized by clear tonality and energetic rhythm, emerged later. Many of his compositions extol the goals and aspirations of the Soviet Union and its people and commemorate important events in Soviet life and history. 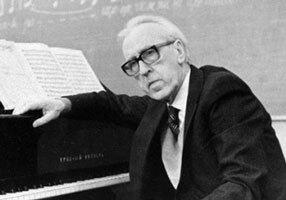 Kabalevsky’s early works include the Piano Sonata No.1 (1928) and the Piano Concerto No.2 (1935), one of his finest compositions. He is perhaps best known for the overture to his opera Colas Breugnon (1936) and for his suite The Comedians (1940). His later compositions include the operetta The Sisters (1967) and the oratorio Letter to the 30th Century (1972). In addition to operas and piano music, Kabalevsky wrote concerti, chamber music, symphonies, and dramatic pieces. He was honored with the Order of Merit in 1940; with the Stalin Prize three times – in 1946 for his Second String Quartet, in 1949 for his Violin Concerto, and in 1951 for his opera The Taras Family – and with the Order of Lenin in 1965. Dmitry Kabalevsky died at an advanced age, not long before final collapse of Soviet regime whose ideals he had served so faithfully.